1. Daintree Wilderness Lodge, Australia. The only place in Australia where Rainforest meets coastline, the Daintree Rainforest has been World Heritage listed since 1981. Located in far North Queensland, this utterly enchanting place can feel remote, magical and mysterious all at the same time. 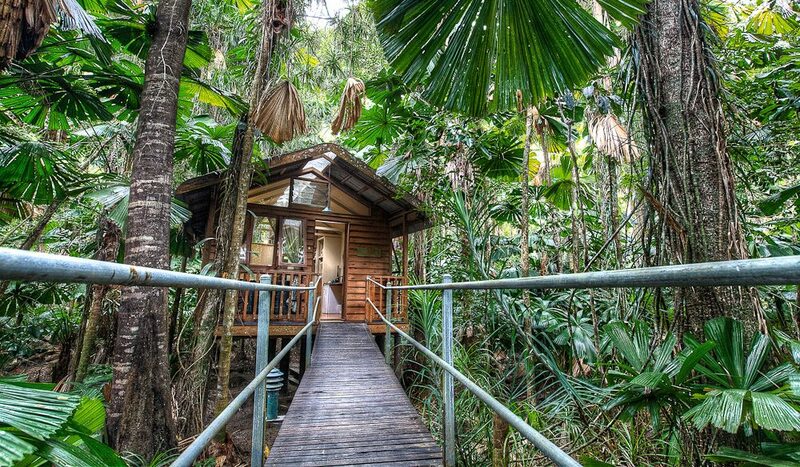 The Daintree Wilderness Lodge is set within an idyllic wonderland of trees, wildlife and water with cabin style rooms positioned on stilts at the end of private walkways. A sunroof in each makes for perfect star gazing opportunities too. Eco accreditation comes from an active commitment to minimising impact on the environment, not just in the way the lodge is positioned but also through daily operations such as water conservation, power source and the bio cycle water waste system. For guests though, the lodge has plenty of nature activities to enjoy. A nature walkway from the lodge winds through the forest to a creek where birds and wildlife spend time, and guests can take a dip. A highlight of the walk are Hope Cycads which take 100 years to grow just 1 metre tall. An outdoor spa under a canopy of trees, surrounded by bush and with the sound of wildlife can enhance any romantic occasion or relax weary muscles for those who have been busy exploring. 2. Nimmo Bay Resort, British Columbia. 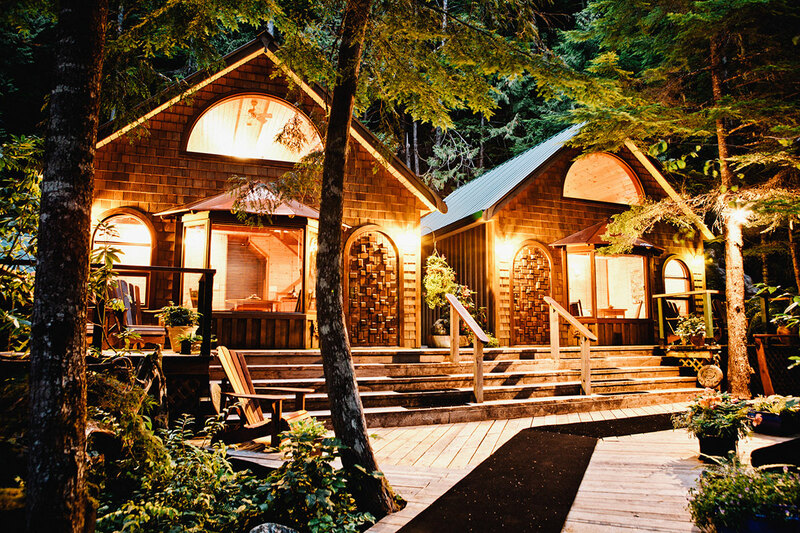 Set at the base of Mount Stephens which reaches 5000 feet into the atmosphere, and perched on the edge of a lake, Nimmo Bay Resort is at the heart of wilderness. Originally the lodge was purchased as an old float house back in 1980 and has evolved somewhat since then, yet remains true to the core intent of that time; to keep the environment in mind. This is the kind of lodge to stay at if spending quiet days doing outdoor activities is your holiday preference. Guests can heli-ski, kayak, paddle board, whale watch, glacier trek; the list goes on but all activities involve the natural surroundings. There’s a choice of two cabin styles. Intertidal cabins are the lakeside cabin and the wildernesses cabin is the answer to what would be an overwater bungalow in the Maldives. Here you can paddle up to the verandah through the day and sit with a glass of red in hand, watching the mountains at dusk. Forest cabins are surrounded by trees and waterfalls, leaving evenings spent listening to the tranquil noise of flowing water. The Murray family have owned and operated Nimmo Bay Resort for 35 years and their statement of sustainability sums up what they are striving to achieve daily: “the bear eats the salmon and then returns nutrients to the forest. We are a part of this natural cycle and our aim is for a perfect balance between what we take from our habitat and what we give back”. 3. 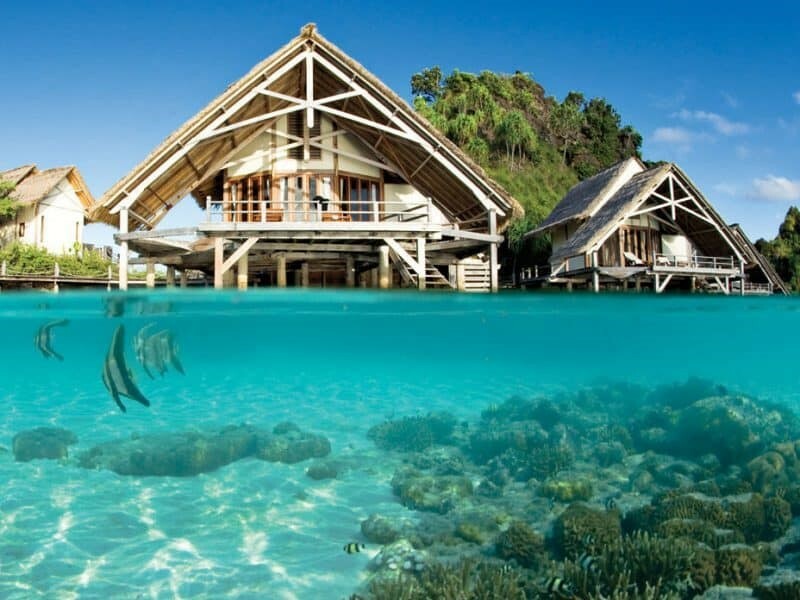 Misool Eco Lodge, Indonesia. Located on a private island in the remote Raja Ampat region of Indonesia, Misool is a tropical island eco paradise. If you like isolation, then Misool is your eco resort, with the closest port 165km away and 20km to the nearest village. Plus, there is a 40 guest max occupancy. Misool isn’t just a remote eco paradise in an idyllic setting though. The resort established a 300,000 acre/1220sq km of marine reserve and a shark and manta sanctuary was also established in 2010. Needless to say, that Misool is a divers heaven with arguably the best reefs on earth. 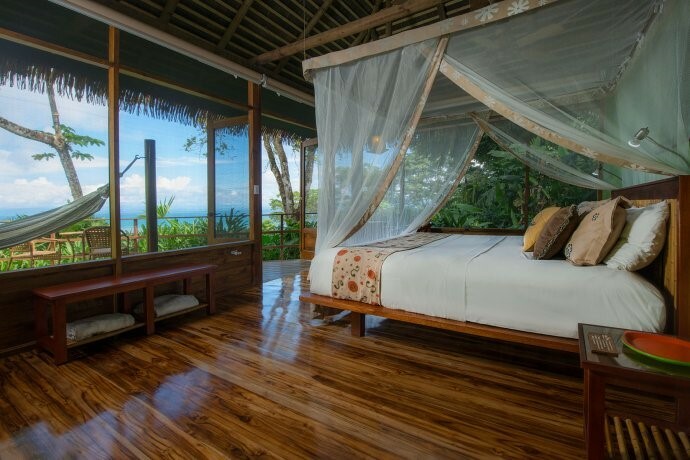 Rooms are overwater structures on stilts, styled to suit the rustic beach vibe mixed with Indonesian charm. A stay at Misool is all about the ocean while responsibly enriching marine biodiversity at the same time as enjoying a well-earned break from city life. 4. Gayana Marine Resort, Indonesia Borneo. You’ll find Gayana on a small island nestled close to the Sabah shores of Indonesian Borneo. Known mostly for jungle and orangutans, heading to this unique island offers a contrast to what most visitors encounter on a Borneo adventure, and with Gayana taking prime position on Malohom Bay, the vistas are truly spectacular. 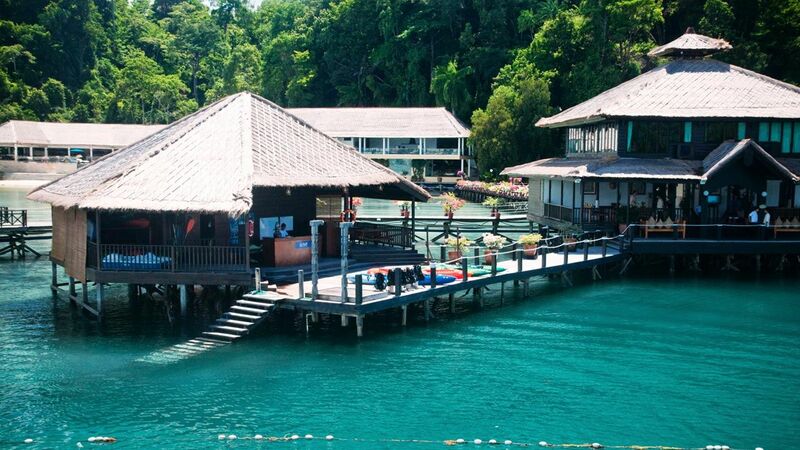 This is a resort which is all about the jungle, the ocean and of course, the reef. Aside from the panoramic views that capture the diversity of both lush jungle vegetation and marine life, what makes Gayana special is that it is the only island resort that also has a regeneration programme. The programme is committed to propagating endangered reefs and marine life. Overwater villas with the sound of the ocean are how guests wake up at Gayana. Rooms are decorated with hints of Indonesian style and carefully selected wood finishing and furnishings that bring elements of the outdoors inside too. Spend days lazying on your private deck with a book between dips in the ocean, scuba dive or snorkel the nearby reefs or enjoy jungle trekking. There is a variety of marked trails from the resort or a four hour trek to the other side of the Island on offer too. 5. Lapa Rios Lodge, Costa Rica. Handpicked as a founding member of National Geographic’s Unique Lodges of the World, Lapa Rios Lodge offers guests a rare selection of experiences. Tucked into the Costa Rican rainforest, wildlife and fauna is the main course with a dessert of palm fringed beaches. These two major environments make for a myriad of activities in peaceful surroundings. Wildlife is a plenty from colourful macaws and rare birdlife, mammals such as sloths, jaguars, monkeys and armadillos, bright butterflies and insects, and marine species too. Lush nature trails drape around the lodge’s bungalows with a choice of ocean or rainforest to sleep among, and a pool surrounded by bush to relax under the warmth of the sun. If ever there was a place to be away from the World, yet have no shortage or things to do; Lapa Rios Lodge will satisfy for romantic getaways, family escapes and anything in between.